Driving in to work this morning, there was a beautiful and glorious sunrise. Very deep oranges, yellows and streaks of blue. 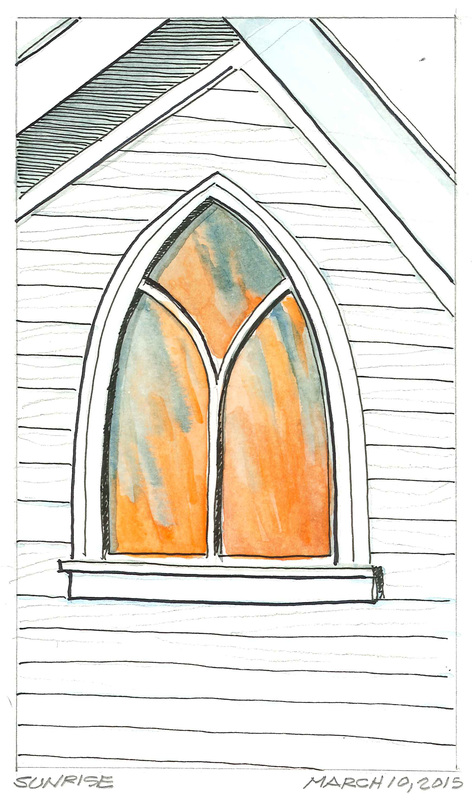 Once I got off the highway, I saw a fiery reflection in an upper gothic window in a white New England church. This sketch is from memory of the image I saw that I painted at lunchtime. Pelikan Watercolors and a Micron Pen in a 6″ x 8″ Moleskine watercolor book. After talking with you at the AIA Lobster-boil I looked forward to a free minute when I could see your blog, and WOW. Now I am going to step up my sketching too–I do this with my camera, always with me, as I roam about in our work, but I think I need to keep the hand trained too. . you are a terrific talent and I can relate on a number of levels, as i love documenting and sketching. I look forward to staying in touch more and perhaps find a way to work together. Until then, keep it up, and I will be checking in regularly. Thank you very much for the kind words Greg. It is a fun journey and a great way to keep the touch. Primarily it is a great way to continue to do what we all got into this great field to do – draw. I love Deborah’s work and will try to get by ARTProv. Great seeing you also and lets keep in touch. Glad to hear you like Deborah’s work .The show should be good. I look forward to seeing you there. btw she loved your drawings too! she loved the watercolors and has painted flowers quite a bit in the textile design feld…you really have a nice technique. keep it up !